We’d love your help. Let us know what’s wrong with this preview of The Crossroads by Pamela Cook. Rosie O’Shea dreams of seeing the world. But right now, the outback hotel she owns is falling down around her ears, her bank account is empty and family duty means she’s staying put. Drought is impacting hard on Stephanie Bailey and her husband. They’ve already been forced to sell almost all their cattle. The rains aren’t coming and her husband is growing more and more dist Rosie O’Shea dreams of seeing the world. But right now, the outback hotel she owns is falling down around her ears, her bank account is empty and family duty means she’s staying put. Drought is impacting hard on Stephanie Bailey and her husband. They’ve already been forced to sell almost all their cattle. The rains aren’t coming and her husband is growing more and more distant. Sydney girl Faith Montgomery, at the age of 31, has just discovered she is adopted. Furious at being lied to for her entire life, she lands a job at the Crossroads Hotel so she can track down her biological mother without revealing who she is. One family. Three women. Will the lies they tell and the secrets they hide lead to more heartache, or will fate bring them together before it’s too late? To ask other readers questions about The Crossroads, please sign up. Rosie’s daughter Stephanie, her husband Bryce and five year old son Jake lived on a nearby farm which had been in Bryce’s family for generations. They too were feeling the effects of the drought. Bryce was becoming more and more withdrawn; Stephanie and he seemed to do nothing but argue. The rains were needed so badly; the majority of their stock had been sold but even the ones that were left were thin and listless in the unrelenting heat. In Sydney, Faith Montgomery had unexpectedly discovered she was adopted. Her decision to find her birth mother was a wild and spur-of-the-moment one and before she had even thought it through, she was on a plane for Queensland. But what if her birth mother wanted nothing to do with her? What would happen in the small outback town when an angry and bitter Faith arrived without any plans or ideas on what to do next? 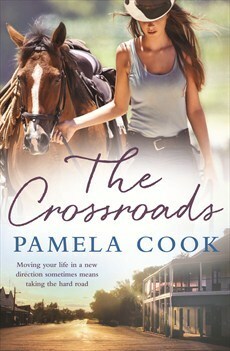 The Crossroads by Aussie author Pamela Cook is set in far north Queensland in the middle of a long and hard drought. The constant heat day and night was something I could feel – the red dirt, the dust which settles on everything no matter how often you clean; all so well written that I felt I was there. (Thank goodness I wasn’t – that heat isn’t for me!) The Crossroads is an emotional read filled with intrigue and the love of family; of secrets kept and of forgiveness – it’s another brilliant read by this talented author. Highly recommended. With thanks to NetGalley and the publisher for this copy to read in exchange for my honest review. When city girl Faith Montgomery heads to the outback Queensland town of Birralong after a life-altering discovery, she finds herself way in over her head. Mother and daughter locals, Rosie O'Shea and Stephanie Bailey, each have their own issues that they are secretly dealing with in the drought stricken town. Now, with Faith thrown into the mix, the three women are about to watch their lives unravel in the most unexpected way. This is my first Pamela Cook rural fiction, and I loved it! Rural fict When city girl Faith Montgomery heads to the outback Queensland town of Birralong after a life-altering discovery, she finds herself way in over her head. Mother and daughter locals, Rosie O'Shea and Stephanie Bailey, each have their own issues that they are secretly dealing with in the drought stricken town. Now, with Faith thrown into the mix, the three women are about to watch their lives unravel in the most unexpected way. This is my first Pamela Cook rural fiction, and I loved it! Rural fiction is another new genre to me, and one that is fast becoming a favourite. What I'm loving about rural fiction is not only that it is relatable in many ways for me living in a region area, but that the characters are beautifully developed. They are real, flawed, and experiencing the challenges and dramas of life just as anyone else. They are characters that could be your next door neighbour, school teacher, or local shop keeper. And I imagine for those city dwellers who love rural fiction, it's the draw of a different lifestyle - but again with characters that are real and relatable. Pamela Cook has created three characters that couldn't be more different if they tried, each with their own quirks, flaws, and distinct voices. But they are all likable! As a writer, I know how difficult it is to create such characters, so am totally envious that Pamela does it with ease. And it's not only the three main characters, Pamela has gone to great lengths to have her secondary characters be as believable and fully formed as Faith, Rosie and Stephanie. Each character adds a different and enjoyable element to the story, in turn adding to the fibre of the overall plot. Without going into the specifics of the story, the plot is well thought out. Pamela expertly weaves each characters journey into the storyline. Tension, humour, drama, and emotion fill every page, all which creates a puzzle and you'll find yourself wondering how it will all fit back together. Of course as with life, it doesn't fit back together perfectly, but the ending is more than satisfying. Pamela's research is evident throughout the book. The fictional town of Birralong is loosely based on the township of Hughenden in Queensland which Pamela visited to help her flesh out the story. She vivaciously captures the outback town and it's outlying areas in striking visuals. She also respectfully does justice to the issues such as drought and depression that often go hand in hand in these areas of Australia. First book of Pamela's that I have read and I was absolutely riveted by the story. I would class this book as a Women's Fiction title as even though it is set in rural Australia, the story-line would apply to any setting. It tells the story of Rose who is the proprietor of a heritage listed hotel that is struggling to survive. She runs the hotel with little help and it needs major repairs that she just hasn't got the money for. Her daughter and husband and grandson live nearby on a farm that is r First book of Pamela's that I have read and I was absolutely riveted by the story. I would class this book as a Women's Fiction title as even though it is set in rural Australia, the story-line would apply to any setting. It tells the story of Rose who is the proprietor of a heritage listed hotel that is struggling to survive. She runs the hotel with little help and it needs major repairs that she just hasn't got the money for. Her daughter and husband and grandson live nearby on a farm that is reeling from the effect of drought. Rose also has a secret that she has kept for years that threatens to reveal itself with the return of a long lost flame from years ago. Faith Montgomery is a city girl who has just been retrenched. With her parents overseas, she comes across an envelope which contains information about herself that will change her life forever. She sees an advertisement for a barmaid at The Crossroads Hotel and decides to apply and what transpires changes her life going forward. An enjoyable read about three different women and how their lives intersect. Entertaining and easy to read. Not normally a fan of what I thought would be romance, but couldn't put this down. It contained really relevant issues that touch all of us such as death, survival, familial relationships to name a few plus realistic characterisation. I easily liked the characters but could see how they appeared to others. Thoroughly enjoyed it and was compelled to finish once I started. Thanks, Pamela Cooke. This is the first Pamela Cook story I have read and it won't be the last beautifully written with characters that are so engaging and alive this one had me riveted from the start till the end and had me feeling like friends with the people of Birralong. This follows the lives of three woman linked but without knowing, when Sydney girl Faith Montgomery is riffling through her parents papers she comes across an envelope addressed to her and this envelope is going to change her life and open up a wh This is the first Pamela Cook story I have read and it won't be the last beautifully written with characters that are so engaging and alive this one had me riveted from the start till the end and had me feeling like friends with the people of Birralong. This follows the lives of three woman linked but without knowing, when Sydney girl Faith Montgomery is riffling through her parents papers she comes across an envelope addressed to her and this envelope is going to change her life and open up a whole new family for her. When Faith starts on her journey to the small Queensland farming town of Birralong she has no idea what is going to happen or how she is going to cope. Stephanie Bailey has lived in Birralong all of her life first growing up at the pub with her parents and now on the farm with her husband and son she loves her life but the drought is hard on them all and things are getting tough now, worries are causing rifts and with a new barmaid at the pub life is about to change again when secrets are revealed. Rose Bailey who is Stephanie's mother and runs the heritage listed town pub The Crossroads has lived here all of her life as well married a visiting Irishman who loved the place and never left bought the pub settled down they had one child and Rose gave up her dreams of travel, but Rose is now widowed and has had a secret that has been kept for 31 years but all is about to uncovered what will it mean for these three woman and the town. I started out liking this book, but ended up loving it so much. The characters are so well defined and so likable that you find yourself wanting to be friends with them. The townsfolk are in a class all of their own but you find that you would like to be a part of that town, a part of their lives. The story is well written and even with each chapter being told my a different character, it all surrounds three women, all linked to one another but only one knows what that link is. The story may be I started out liking this book, but ended up loving it so much. The characters are so well defined and so likable that you find yourself wanting to be friends with them. The townsfolk are in a class all of their own but you find that you would like to be a part of that town, a part of their lives. The story is well written and even with each chapter being told my a different character, it all surrounds three women, all linked to one another but only one knows what that link is. The story may be about a dry town, but the story is anything but dry. It is filled with the turmoils that brew inside each one of these women, each with their own problems that neither want to divulge to anyone, including those who are closest to them. But when the cover is removed from this pot, the revelations come to light, the pieces come together and become a beautifully completed puzzle. Not that there isn't a bit of a struggle to put them together, but with all puzzles, the end result is just the same....perfection. I think I’ve said this many times on the blog, but I have a strange aversion to book covers with horses. Over the last few years, I’ve found that these books are quite often gems and the horse not a major part of the story. This is true of The Crossroads – only one of the main characters has a horse, and she doesn’t spend all her time talking about it. (I like horsepower, over the real thing). Whether you’re a fan of horses or not, I recommend The Crossroads as a lovely Aussie rural fiction read I think I’ve said this many times on the blog, but I have a strange aversion to book covers with horses. Over the last few years, I’ve found that these books are quite often gems and the horse not a major part of the story. This is true of The Crossroads – only one of the main characters has a horse, and she doesn’t spend all her time talking about it. (I like horsepower, over the real thing). Whether you’re a fan of horses or not, I recommend The Crossroads as a lovely Aussie rural fiction read. It has everything you want – battles against external factors, a race against time, love, loss and ultimately a happy ending. It would make for a great summer or holiday read. Times are tough in the small Queensland town of Birralong. Drought has affected the area badly and the whole town is feeling the pinch. Rose O’Shea runs the local pub, The Crossroads, which is suffering too – business is weak and she can’t afford to pay for the repairs to the heritage listed building. Her daughter Stephanie lives on a property outside of town and the drought has turned her once happy husband into an uncommunicative recluse. Meanwhile in Sydney, Faith Montgomery gets the surprise of her life when she looks for some documentation for her parents – her birth certificate with another name on it. As she’s at a loose end, what better time to track down her birth mother than in a tiny northern town? As the women try to work through their own problems, there are other, more pleasant issues thrown in their path. Rose is treated to the return of an old flame, while Faith enjoys the company of the brother of Stephanie’s husband. However, it’s when things get desperate and the three women pull together that the book really begins to shine. I was impressed how Rose, Faith and Stephanie worked together in a crisis, all drawing on their own strengths to orchestrate a response in an emergency. At this point, I felt like I knew each of these characters really well – kudos to Pamela Cook for making them sound like real people, who I could be friends with. The crisis was for me the most gripping part of the book. The writing was wonderfully atmospheric with the tension and strain on each character palpable. Another thing which I really liked about The Crossroads was how it didn’t make a big mystery out of who Faith’s mum was. It was revealed early on and the journey was about Faith working up the courage to reveal herself to her mother (or BM as she calls her). It was a really unique thing to read as she watched her mum, trying to find similarities between them while she tried to act as a stranger/employee. Pamela Cook really translated across the page the awkwardness that Faith was feeling. A little thing that worked well for me were the weather descriptions – reading this in a range of weathers, I really felt the heat and dryness of a long Aussie summer. The whole story of The Crossroads just worked for me. I loved the combination of grit and love that helped these women make it through tough times. Thank you to Hachette for the copy of this book. My review is honest. This story is about three women with life troubles; Rosie, owner of the Crossroads, a decrepit heritage listed outback hotel, is guarding a secret which she has never revealed to a single soul. A widow, she is bearing the stress of her financial worries alone. Rosie also has a dream, to travel overseas to build on her culinary skills. Stephanie is Rosies' daughter, married to Bryce, they live on their station where they ought to be growing beef but the prolonged drought is bringing them to their knees. Bryce is depressed and withdrawn, Stephanie strives to shield their little son from the effects of his fathers depression. Faith is a Sydney girl, she has recently lost both a job and a boyfriend. Her parents are on a cruise, they ask Faith to find some documents they need. She finds far more than she bargained for. This discovery leads her to Birralong and the Crossroads Hotel …. Rural romance/rural fiction is certainly not my usual genre but, despite that, I did enjoy this book. There is a reason why it is so very popular, for me there is a comfort in the formula - things go bad, things improve and then there is usually a pleasant ending to look forward to. Having said that, this story is not quite as predictable as I expected, there’s a bit of a surprise in there for us readers! I like that this is a heartwarming story, well written and easy to read. The author did her research well, basing Birralong on the township of Hughendon in Far North Queensland, a town but three hours or so from the gorgeous Julia Creek where I lived and worked for a few months. To those like me who do not normally read this genre I would recommend this book as a refreshing change from the sometimes disturbing world of crime fiction. Another gem from Pamela Cook which I think may be her best yet. This is a story of three women that engages you from the start. Cleverly and tightly written, the story is presented from the perspective of each woman which ensures that the story is engaging and never dull or slow. These are strong women, each with personalities that you can easily relate to, but as in real life, each have their own flaws. And it is the blending of all of this that keeps you wanting more. Pamela creatively construct Another gem from Pamela Cook which I think may be her best yet. Pamela creatively constructs a story around these women and the people in their lives that draws you in... you feel you are a part of the town, know and empathise with the people and can smell, "see" and touch the environment around them. Beautiful in its description, the story presents the feelings and emotions of the characters in a realistic and compassionate way. I found myself willing them along. I felt part of the story, laughing with them, felt their despair, their sadness and joy. A charming read full of likeable characters depicted against a backdrop of sweeping, arid landscape that is both beautiful and harsh. The story held a couple of surprises with a finish that wrapt up each of the character's challenges in the story. Initially I found this story a bit hard to get into, but once I worked out the relationship between the three main characters it was much easier to read. The story was predictable, but still enjoyable. The story of three women whose lives cross paths in outback Australia. An evocatively written tale, focused on the female perspective. I really enjoyed this story, particularly the way it dealt with adoption and the issues around that. The key relationship felt a little odd at the start - the heroine went from 'you are an annoying, self-important person' to 'oh my god, you are so amazing' too fast. And one of the HEA for two of the secondary characters was a bit forced. It seemed like the author The story of three women whose lives cross paths in outback Australia. An evocatively written tale, focused on the female perspective. Fabulous! Another great read by Pamela. Interesting characters, intriguing plot, laughs and tears, all set against the fabulous backdrop of rural Northern Queensland. A heartfelt, emotional story of three women whose lives are intertwined in ways they didn't even know. This is a three hanky read that will have you feeling every emotion as you turn the pages of the fantastic story! The Crossroads has a ton of heart. Its centered around 1 family. Each member has their own set of individual struggles, as well as struggles as couples and as members of a family. It was emotional. Having lived a part of my childhood in Hughenden, I was convinced this story was based on this town. Glad to see the author confirm this at the end! Very easy read with a good story. Enjoyed it a lot.